In our previous post, we studied a manufacturing technique called Cut Rifling. As we noted in the previous post, Cut Rifling produces very accurate results, but it is very slow to manufacture as the rifling is cut little by little. Now we will study a more modern technique called Broach Rifling. A broach is merely a long tool with multiple cutting elements on it. A broaching tool may be pulled or pushed along a workpiece. It must be noted that each cutting element on the broach tool is slightly larger than the previous one. The image above shows a typical rotary pull-type broach tool. The tool is placed inside an item to be cut and then rotated and pulled through the item. The tool has a set of roughing teeth that make the initial rough cuts, followed by a set of semi-finishing teeth that make finer cuts, followed by a set of very fine finishing teeth that leave a very good finish. The diameter of the rear pilot section of the broaching tool is a little less than the diameter of the finishing teeth. Making a good broaching tool is key to this technique and the broach tool is unique in that rough-cuts, semi-finishing and final-finishing is all done with the same tool. The process of broaching was invented in the 1850s or so, but it was only applied to making rifling after WW-I ended in 1918. Advances in broaching machines have made this method very competitive with other machining processes. This type of tool is called a gang-broach because it has multiple cutting rings. Each ring is of a slightly larger diameter than the previous one and has multiple cutting edges. The last ring is of the desired groove diameter of the barrel. The rod is twisted at an uniform rate as it is being pulled through the barrel. This provides the spiral rifling grooves. Since each ring has multiple cutting edges, all the grooves may be cut at the same time and with a single pass of the broaching tool. Broach cutting works similar to the Cut Rifling process we studied in the previous post, except that there is no need to make multiple passes to get the desired groove depth. The entire job can be done in a single pass and provide quite accurate results. Quite a few barrel manufacturers use broach cutting to rifle their barrels. 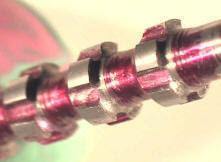 The disadvantage of broach cutting is that it requires some skilled workers to make the broach tools. Also, a broach tool is always designed for a very specific job and cannot be reused to make a different barrel, say one with more grooves or a different diameter etc. For each job that has a different diameter or number of grooves, a separate broach tool must be manufactured first. What an excellent series of articles! !